No matter your feelings about whether a now-established company should be using Kickstarter, the fact is Pebble set a new record this week with Time. 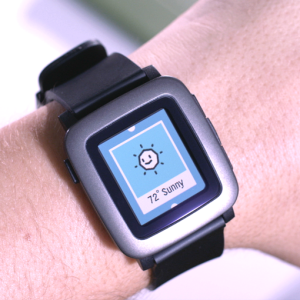 In 48 hours Pebble’s newest smartwatch raised more than $11 million—a Kickstarter record. The smartwatch has a metal frame, is lighter and thinner than the first watch, and has a color screen. There are still 28 days to go on the campaign. In case you missed it, Google released YouTube Kids for Android this week. The content is curated so as to be family-friendly, there are parental controls such as a timer, sound settings, and search settings. Oh, and it has a “bright and playful design.” Parents everywhere are #winning. Apple’s rolling out “The new Concierge” the week of March 9th to replace walk-in Genius Bar appointments. Rather than getting a specific return time after being triaged, with the change you’ll get an approximate wait time and then two text messages – one to tell you to start heading back to the store and a second telling you your “Genius” is available and ready to see you. Also happening March 9th is an Apple Watch event. Reporters are being invited to San Francisco’s Yerba Buena Center for the Arts and they expect to learn about the final pricing, get some demos, and timing specifics. Gizmodo featured a story this week about a new startup same-day delivery service called Magic. “There’s no app. No web interface. You simply text the number your request, make a payment with Swipe, and Magic handles the rest. Literally.” They ordered a fish in a tank for $200 and found the service to be Magical. Re/code tried it and didn’t find it so. CNN tried to give it a spin, but ended up one of more than 25,000 people on the waitlist so it could be a while before we have their review. The service is available anywhere in the U.S. but reportedly those on the outskirts of cities have been the most happy with it. The tech blogs were really taken by Seasame this week and if you watch the video, I can see why. It’s $139 (early bird pricing, anyway – it’ll be $199 on store shelves), takes seconds to install, and appears to work like a dream. And come on, you can’t deny the name – it’s clever, amiright? While Apple is in the midst of building their spaceship-shaped headquarters, Google wants some new digs too. The New York Times reports that Google will be pitching a new space of their own to the city of Mountain View, California. The new Googlplex is apparently a set of “canopylike buildings” and will have lots of bike and pedestrian paths. There is already tension in Mountain View – the long-time residents of this formerly quiet town now deal with horrific traffic and more because of Google’s presence. The article talks about all the issues and it’s pretty interesting. After working with mental health groups, including the National Suicide Prevention Lifeline, this week Facebook announced new tools to help those who may be considering taking their own lives. The new features allow someone to report a concerning post which will then be reviewed by a trained team. If necessary, Facebook with then reach out to that person privately with suicide prevention resources. This team will also contact the person who reports the concerning post, giving them resources and support as well. The move is being heralded as a much-needed overhaul to the old reporting system. The changes will roll out over the next few months. And really, you couldn’t go to any news site this week without hearing about the FCC ruling about net neutrality. Rather than rehashing what happened here, check out this piece in ARS Technica which is a good summary of what happened and what’s to come. Gigaom also has a nice story explaining what the ruling means for the average consumer. A former Kickstarter, the Sense sleep monitor officially hit the market this week. For $129 you can get a sleep tracker that does a lot more than your Fitbit or other device. It’s a two-part system. First you clip a sensor to your pillow (called the Sleep Pill) but the bulk of the work is done by the orb-shaped sensor you put near your bed. It keeps track of noise, light, temperature, humidity and even pollen and dust. Sense also will wake you at the time it determines, based on how you’re sleeping, you’ll be most receptive to an alarm. This Week on TV: Katniss Everdeen is back!